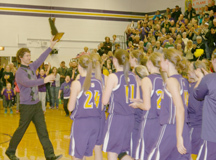 The Blissfield Lady Royals captured their second straight district championship title Friday night, Feb. 28, defeating the Lady Patriots of Britton Deerfield on home court by a score of 51-34. They now move to regional action. For the complete story, please see the March 5, 2014, edition of The Advance.